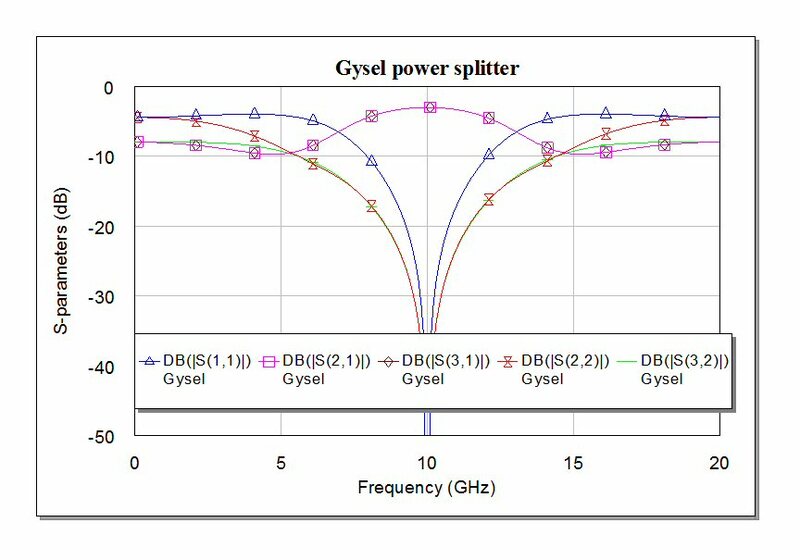 Ulrich Gysel published a IEEE paper titled "A New N-way Power Divider/Combiner Suitable for High-Power Applications" in 1975. His solution looks like a cross between a branchline and a Wilkinson, but it is also closely related to the rat-race coupler. It provides in-phase outputs, is configured most commonly as a five-port (for a two-way split with two terminations) but serves as an N-way splitter as well (hence, the title of the paper...) We will describe a two-way Gysel on this page. Here is information on an N-way version. The Gysel divider is often used in kilowatt-level power combining, for example, if you want some redundancy in a 50,000 watt television transmitter you could use a five-way Gysel combiner with 15,000 watt tubes and be able to remove one of the tubes for service or replacement without taking the transmitter off-line. The terminations will need to be oil-cooled to dump all of the wasted power, but that is doable. 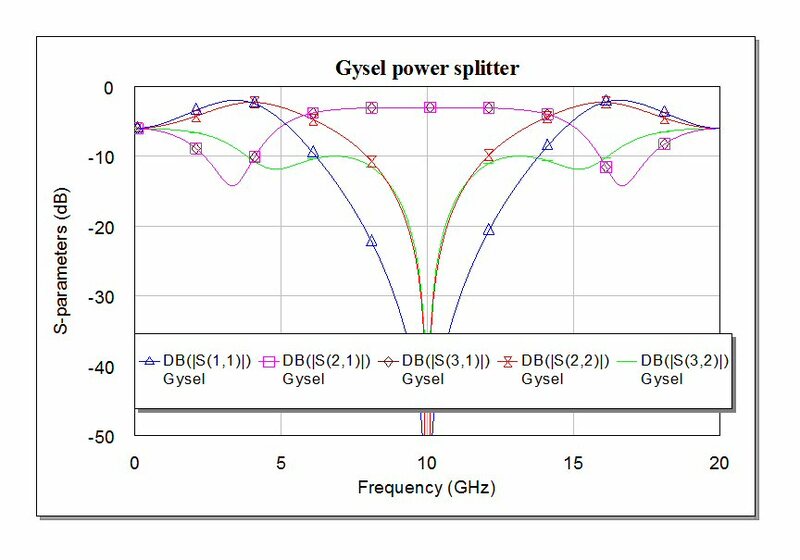 Gysel dividers are finding their way into the millimeter-wave spectrum, when gallium nitride amplifiers are combined in solid-state power amps (SSPAs) that will compete with vacuum tubes such as TWTs. Speaking of oil, here is a video of a massive, 1911 Rumely Oil Pull plowing up a grass field in Ontario. It's got nothing to do with power splitters, but it is rated at 30 horsepower, and it outlasted the Titanic by 100 years. If you owned this tractor, you'd be cooler than Justin Bieber. Eh? New for April 2011! How do you pronounce "Gysel"? We didn't know, until we contacted Ulrich! It's simple, it rhymes with "diesel" and the "g" is the same sound in "good". Got that? The beauty of the Gysel, compared to the Wilkinson, is that the isolation resistors become one-ports, which makes it much easier to realize good thermal performance. The resistors are much more forgiving in terms of parasitic phase response (they don't need to be "zero length"). Z4=25 ohms (other values are possible, it affects the bandwidth). The big advantage of the Gysel power splitter is its power handling. In a Wilkinson splitter, the resistor is embedded into the network, and must provide a short phase length for the scheme to work. The terminations in a Gysel are equal to Z0, and can be high-power loads if power handling is a requirement (such as in a transmitter). The loads can be external to the power splitter, any length of Z0 transmission line can be added between the loads and the splitter. Etched onto a thin-film, there is no way to measure the resistor in a Wilkinson, because it is shorted out by the transmission lines around it. The Gysel allows the two resistors to be measured in parallel, even if they are grounded to the substrate. 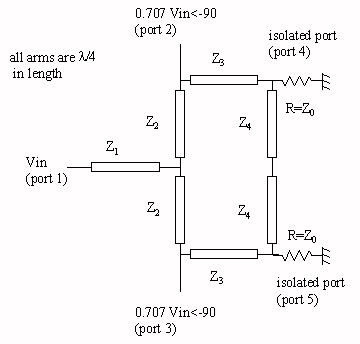 Below is a plot of the insertion loss from input to the two output ports. The one dB bandwidth is a remarkable 61.8%, which is more than double the bandwidth of a simple branchline power splitter. The final plot shows the return loss at port 1, as well as the isolation between ports 2 and 3. The return loss bandwidth for 1.5:1 VSWR (-14 dB return loss) is 44.4%. This again beats the simple branchline which provides 20.8% bandwidth at 1.5:1 VSWR. Now let's take a look at some of the degrees of freedom of the Gysel splitter. You can learn more about them on this page. Below is a generic Gysel schematic, with 100 ohm terminations and 70.7 ohm uniform impedance around the ring. We have demoted the three different impedances around the ring, Z1, Z2 and Z3 as well as the terminations ZT in the upper left field. Here is the response of the "normal" two-way Gysel. Now let's see what happens if we change the ZT terminations to 50 ohms (which affects the Z2 impedance, it is now 50 ohms). 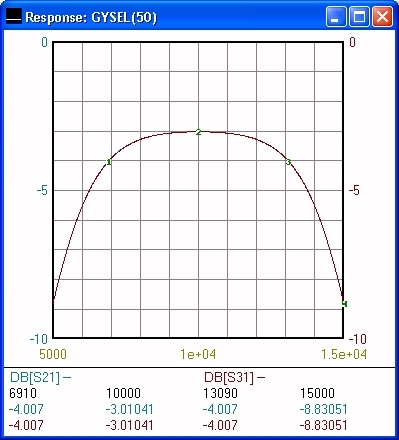 The response has narrower band input reflection coefficient. 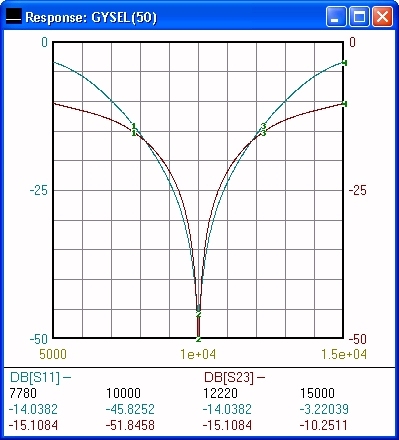 The input reflection coefficient is much wider band, but the output reflection coefficients and isolation suffer decreased bandwidth. The transmission coefficient is flatter over a wider band. This is usually the figure of merit that designers want to focus on. What is the best Gysel solution? beauty is in the eye of the beholder. 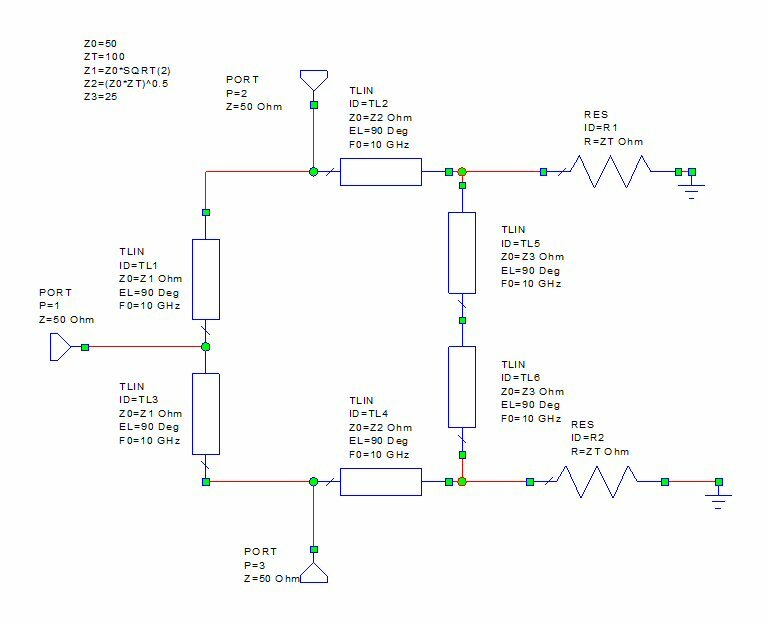 You can use an optimizer to widen the bandwidth at the expense of the perfect match at band center, while you allow Z2, Z3 and ZT to optimize with appropriate constraints.